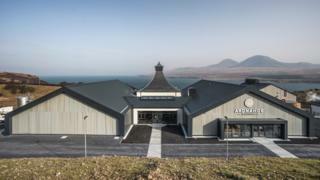 Islay's first new distillery for nearly 15 years has officially opened its doors. Ardnahoe Distillery was built with a £12m investment from Scottish family-owned Hunter Laing & Company. Ardnahoe, which is located on the island's north east coast between the Caol Ila and Bunnahabhain distilleries, hopes to attract 20,000 visitors a year. The opening ceremony was conducted by Lord Robertson of Port Ellen. The distillery will make a peated spirit for maturation in used bourbon barrels and Spanish sherry casks. It includes a visitor centre with retail facilities, a whisky bar and a restaurant. Up to 30 people will be employed across retail, dining, tours and functions throughout the year. Ardonahoe brings the number of working distilleries on Islay to nine. The last one to open was Kilchoman in 2005.
Business development director Andrew Laing said: "Ardnahoe is one of a series of new developments that will continue to strengthen Hunter Laing over the coming years. "We have a strong development team working on new international brands and we are targeting several important new markets that will fuel our continued growth."